Fun birthday party invitation suitable for both boys and girls parties. The invite features a funny little party monster holding a cupcake and a balloon. Cute and somewhat whimsical cartoon illustration. On the back is a pattern of green, diagonal stripes. Other coordinating products are also available. 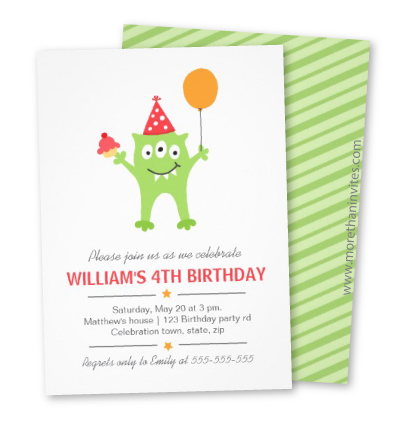 This monster themed birthday party invitation can be bought from Zazzle.